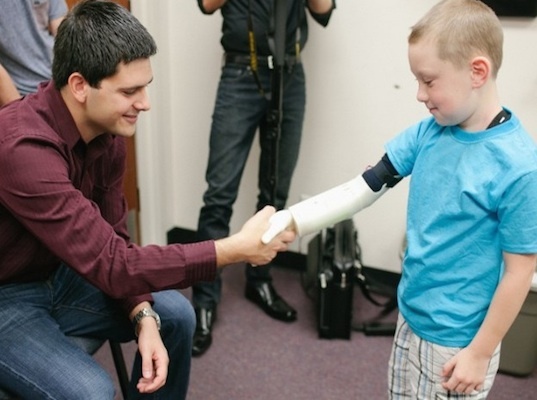 Human Genius: 7 Unbelievable Places That Really Exist..
7 Unbelievable Places That Really Exist.. The Swallow's Nest (Ukrainian: Ластівчине гніздо, Lastivchyne hnizdo, Russian: , Lastochkino gnezdo) is a decorative castle located at Gaspra, a small spa town between Yalta and Alupka, in the Crimean Peninsula. It was built between 1911 and 1912, on top of the 40-metre (130 ft) high Aurora Cliff, in a Neo-Gothicdesign by the Russian architect Leonid Sherwood for the Baltic German businessman Baron von Steingel. The castle overlooks the Cape of Ai-Todor on the Black Sea coast and is located near the remains of the Roman castrum of Charax. 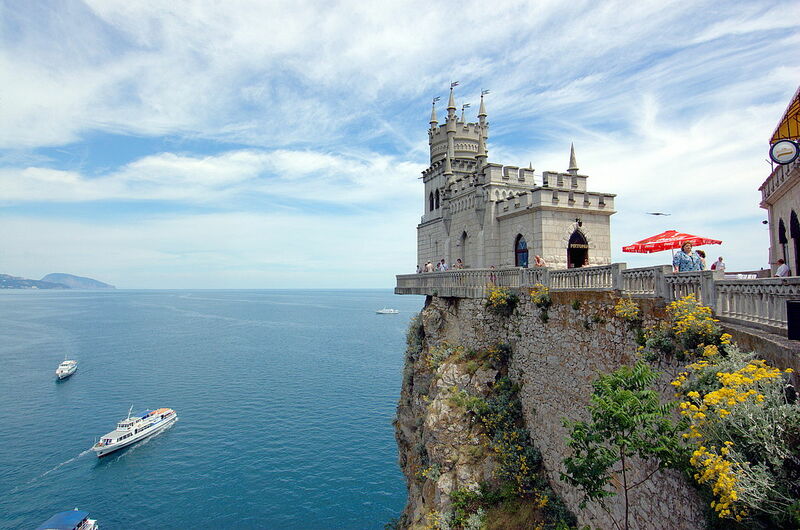 The Swallow's Nest is one of the most popular visitor attractions in Crimea, having become the symbol of Crimea's southern coastline. The first building on the Aurora Cliff was constructed for a Russian general circa 1895. The first structure he built was a wooden cottage romantically named the "Castle of Love." Later on, the ownership of the cottage passed to A. K. Tobin, a court doctor to the Russian Tsar. In 1911, Baron von Steingel, a Baltic German noble who had made a fortune extracting oil in Baku, acquired the timber cottage and within a year had it replaced with the current building called Schwalbennest. The Scots Baronial and Moorish Revival styles had been introduced in the Crimea in the 1820s by Edward Blore, the architect of the Vorontsov Palace (1828–46). Compared to the Alupka and Koreiz palaces, the Swallow's Nest is closer in style to various German fairy-tale inspired castle follies, such as Lichtenstein Castle, Neuschwanstein Castle and Stolzenfels Castle, although its precarious seaside setting on the cliffs draws parallels with the Belém Tower in Portugal, or Miramare Castle on the Gulf of Trieste outside Trieste, Italy. In 1914, von Steingel sold the building to P. G. Shelaputin to be used as a restaurant.For a short time after the 1917 Russian Revolution, the building was used only as a tourist attraction. In 1927, the Swallow's Nest survived a serious earthquake rated at 6 to 7 on the Richter scale. The building was not damaged apart from some small decorative items that were thrown into the sea along with a small portion of the cliff. However, the cliff itself developed a huge crack. In the 1930s, the building was used by a reading club from the nearby "Zhemchuzhina" (Pearl) resort, however it was closed shortly thereafter as a safety precaution due to the damage it had suffered in the quake, remaining closed for the next 40 years. Renovation and restoration of the building was started only in 1968. The project involved the restoration of a small portion of the castle and the addition of a monolithic console concrete plate to strengthen the cliff. Since 1975, a restaurant has operated within the building. In 2011, the Swallow's Nest was closed for three months due to major restoration work estimated to cost 1,200,000 hryvnias ($150,000 USD). Sơn Đoòng Cave (Vietnamese: Hang Sơn Đoòng 'cave of the mountain river' or 'mountain cave of Đoòng [village]' in Vietnamese), is a solutional cave in Phong Nha-Kẻ Bàng National Park, Bố Trạch District, Quảng Bình Province, Vietnam. 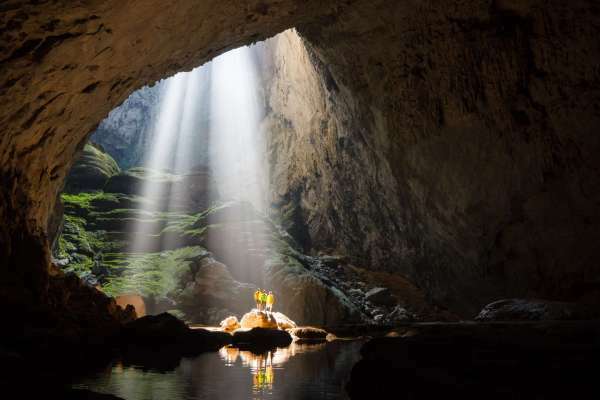 As of 2009 it has the largest known cave passage cross-section in the world, and is located near the Laos–Vietnam border. Inside is a large, fast-flowing subterranean river. It was formed in Carboniferous/Permian limestone and is believed to be between 2 and 5 million years old.Hang Sơn Đoòng was found by a local man named Hồ Khanh in 1991. The whistling sound of wind and roar of a rushing stream in the cave heard through the entrance as well as the steep descent prevented the local people from entering the cave. Only in 2009 did the cave become internationally known after a group of cavers from the British Cave Research Association, led by Howard Limbert, conducted a survey in Phong Nha-Kẻ Bàng from 10 to 14 April 2009. Their progress was stopped by a large, 60-metre (200 ft) high calcite wall, which was named the Great Wall of Vietnam. It was traversed in 2010 when the group reached the end of the cave passage.According to Limbert, the main Sơn Đoòng cave passage is the largest known cave passage in the world by volume – 38.4×106 cubic metres (1.36×109 cu ft). It is more than 5 kilometres (3.1 mi) long, 200 metres (660 ft) high and 150 metres (490 ft) wide. Its cross-section is believed to be twice that of the next largest passage, in Deer Cave, Malaysia.The cave runs for approximately 9 kilometres (5.6 mi) and is punctuated by 2 large dolines, which are areas where the ceiling of the cave has collapsed. The dolines allow sunlight to enter sections of the cave which has resulted in the growth of trees as well as other vegetation. According to legend, construction of the temple was started at the end of the Northern Wei dynasty by only one man, a monk named Liao Ran Over the next 1,400 years, many repairs and extensions have led to its present-day scale.The Hanging Temple, also Hanging Monastery or Xuankong Temple (simplified Chinese: traditional Chinese: pinyin: Xuánkōng Sì) is a temple built into a cliff (75 m or 246 ft above the ground) near Mount Heng in Hunyuan County, Datong City, Shanxi province, China. The closest city is Datong, 64.23 kilometers to the northwest. Along with the Yungang Grottoes, the Hanging Temple is one of the main tourist attractions and historical sites in the Datong area. 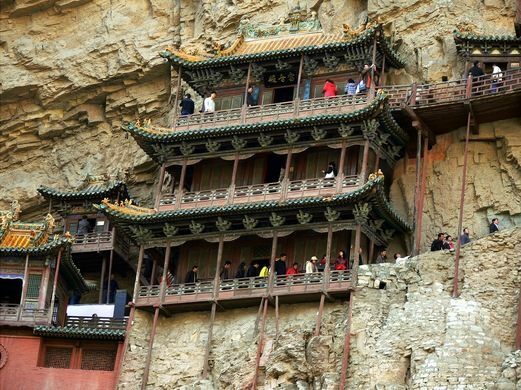 Built more than 1,500 years ago, this temple is notable not only for its location on a sheer precipice but also because it is the only existing temple with the combination of three Chinese traditional religions: Buddhism, Taoism, and Confucianism. The structure is kept in place with oak crossbeams fitted into holes chiseled into the cliffs. The main supportive structure is hidden inside the bedrock. The monastery is located in the small canyon basin, and the body of the building hangs from the middle of the cliff under the prominent summit, protecting the temple from rain erosion and sunlight. Coupled with the repair of the dynasties, the color tattoo in the temple is relatively well preserved. On December 2010, it was listed in the “Time” magazine as the world's top ten most odd dangerous buildings. The primary attraction of Yoro, a town located in Gifu, Japan, on the eastern side of the Yoro Mountains, Yoro Park is a theme park described as an “experience park,” where visitors are told to expect the unexpected.Visitors to the park, which sits in a town of only 33,000, are led through the many attractions by a series of guides who know how best to manipulate the surroundings. 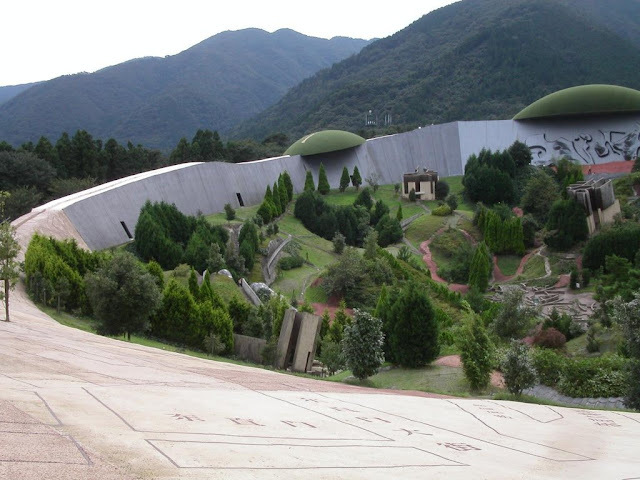 Attractions include the Critical Resemblance House; the Reversible Destiny Office; and the Elliptical Field, which resembled a large, bowl-shaped basin. The Critical Resemblance House has a map of Gifu Prefecture as its roof and is filled with sets of furniture arranged in pairs on the floor, the ceiling, and even under the floor. The Elliptical Field is a series of nine pavilions joined by an intricate network of 148 paths.The park also includes golf courses, tennis courts, food courts, and a special area called Kid’s World. Constructed in October 1995, Yoro Park was designed to incorporate the 100 waterfalls in the immediate area, which are another popular draw for visitors. Monsanto is a village and a former civil parish in the municipality of Idanha-a-Nova, Portugal. In 2013, the parish merged into the new parish Monsanto e Idanha-a-Velha. It covered an area of 131.76 km² and had 828 inhabitants (June 30, 2011). It was the principal town of the concelhobetween 1174 and the beginning of the 19th century, and the county seat in the period of 1758-1853. In recent decades, Monsanto has become popularly known as "the most Portuguese village of Portugal" in a class of twelve classified historic villages in Portugal. The emblem of Portugal, the Silver Rooster (Galo de Prata), designed by Abel Pereira da Silva, can be seen atop the Clock Tower or Lucano. The mountain Monsanto (Latin: Mons Sanctus) rises abruptly to the East of the Idanha-a-Nova up to 758 meters above sea level. The earliest traces of man is from Early Stone Age at the time of the ice-ages. Later, Romans settled at the base of the mountain. Also traces from Visigoth in the early Middle Ages and even earlier Arab presence has been found in the area. In the 12th century, King Afonso I of Portugal conquered Monsanto from the Moors as part of the Christian Reconquista. In 1165, he granted the custody of the city to a knights' order of the church, first to the Order of Knights Templar, and later to the Order of Santiago. The city was given to the military orders to maintain the reconquered city with Christian hands, and Grand Master the Order of Knights Templar, Gualdim Pais, was manager of the building of the fortress. Later, King Sancho I of Portugal reconstructed and repopulated it after the wars with the Leonese. Unfortunately, the medieval castle was destroyed in the nineteenth century because of an explosion in the ammunition depot of the castle. 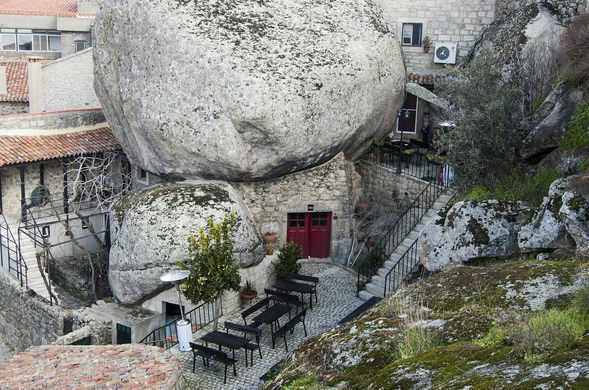 The mountain rock is granite, which also the historic and present village is built upon in a fusion of nature and its landforms. This fusion can be seen in the uses of caves and rocks being converted into construction parts. Visitors can reach there either by their own vehicle or through public transportation. For public transport, you can reach Halle Train station and get a bus till the entry of the forest.Historically, the Hallerbos was part of the Silva Carbonaria, along with other forests in the vicinity including the Sonian Forest and Meerdaal. As late as 1777, it was still connected by a woodland strip to the Sonian Forest. During World War I, most of the old trees were removed by the occupying German forces. 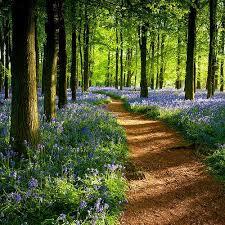 Reforestation took place from 1930 to 1950. 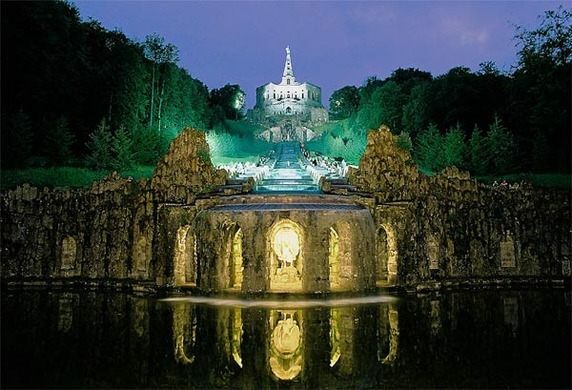 Bergpark Wilhelmshöhe is a landscape park in Kassel, Germany. The area of the park is 2.4 square kilometres (590 acres), making it the largest European hillside park, and second largest park on a hill slope in the world. Construction of the Bergpark, or "mountain park", began in 1696 at the behest of the Landgraves of Hesse-Kassel and took about 150 years. The park is open to the public today. Since 2013, it has been a UNESCO World Heritage Site.At the site of today's mountain park was in the 17th century, a wooded slope of the Habichtswald, more than five kilometers west - and thus far outside - the former Kassel city limits. On the site of the current Wilhelmshöhe Castle, the Weissenstein Monastery of the Augustinian Canons was founded in 1143 from Mainz . It existed from 1193 as a nunnery and was dissolved after the Reformation in Hesse (around 1517/1518). The remaining buildings were used by Landgrave Philip I as hunting lodge. From 1606 to 1610, Landgrave Moritz von Hessen-Kassel built a hunting lodge there, which continued to bear the name of Weissenstein .The Bergpark was built from 1696 in baroque form under Landgrave Karl , as with the construction of the Small Hercules (also known as age winter box) was started. Its place of construction, on which still some wall and foundation remains are, was the hut mountain ( 555 m ). However, it was decided to abandon this mountain, which is located about 400 meters south-southeast of today's Hercules , as a focal point of the park and thus as a place of construction, so that the work was stopped. Landgrave Karl hired in 1696 the French inventor Denis Papin , who constructed a steam pump to operate a water fountain and was one of the first inventors of a steam enginealong with Thomas Savery - the pump never worked properly. Karl was unwilling to continue to finance the development, and an attempt to cooperate with Gottfried Wilhelm Leibniz for this purpose , who at the same time worked at the Herrenhausen Gardens in Hanover, failed because of Leibniz's lack of interest. Until well into the 19th century, the park was developed according to the current ideas. In particular, two construction phases were important that shape the park today. [ 1 ] wikipedia ,the free encyclopedia.